Eric Olson fondly remembers when Ben Dupree visited his laboratory, based at the University of Texas Southwestern Medical Center. Dupree, then a 24-year-old graduate from Southern Methodist University of Texas, rolled his wheelchair into Olson’s laboratory and peered with wide eyes at the photograph that could save his life. In an image of his own cells, he saw the correction of a mutation responsible for Duchenne muscular dystrophy, the terminal illness that had prevented him from being fully active since age seven. At the time, Dupree had already lived four years past his life expectancy. He was one of many hopeful young men with muscular dystrophy who had donated his cells to Olson, co-director of the University of Texas Southwestern Wellstone Muscular Dystrophy Cooperative Research Center. Olson and his colleagues had used a specific gene editing technology, known as CRISPR, to correct the mutated gene in Dupree’s own cells. Just a few years prior, in the same laboratory, Olson and his colleagues used the same technology to cure muscular dystrophy in mice models. According to the US Centers for Disease Control and Prevention, Duchenne muscular dystrophy is the most common fatal genetic disorder diagnosed in childhood. Duchenne affects about one in every 3,500 male births worldwide and is caused by a mutation in the gene that encodes for the protein dystrophin. The absence of dystrophin causes progressive muscle weakness, leading to serious medical problems and a life expectancy of only 20 to 30 years in most cases. Since the Duchenne gene is found on the X chromosome, the disease is most common in males. Although there are medical treatments that may help slow its progression, there is currently no cure for Duchenne. Scientists are hopeful that CRISPR can provide just that. CRISPR is a bacterial defence system that allows researchers to quickly and easily edit genes. You can think of it as a pair of genetic scissors. These scissors are more efficient than other gene-editing technologies because they can be easily redirected to cut chosen spots on human chromosomes. Scientists can, for example, use the technology to snip a single gene out of the 20,000 genes in the human genome, including those causing genetic diseases. The function of the specific technology Olson is using, known as CRISPR/Cas-9, was first described in 2012 by Jennifer Doudna and Emmanuelle Charpentier, at the University of California, Berkeley. In June this year, Doudna and Charpentier were awarded a US patent for their CRISPR/Cas-9 invention. Since its discovery, CRISPR has been used in thousands of studies in the hope of finding effective treatments, or even cures, for a range of conditions and diseases, including HIV-1, blindness, mental health disorders and cancer. 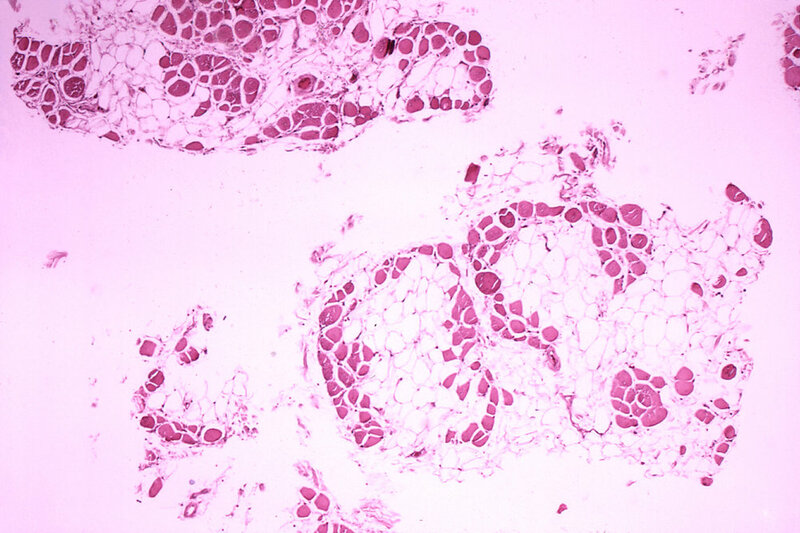 Likewise, CRISPR could be incredibly useful for safely treating muscular dystrophy in human patients, says Thomas Saunders, director of the Transgenic Animal Model Core at the University of Michigan. “It’s really a question of being able to take the CRISPR agents and put them into the muscles of the patients so that, unlike other types of genetic therapies, we can deliver the CRISPR protein to the muscle that will decay automatically without causing other damage,” he says. It may take a few years to get approval to test CRISPR in humans, but in the meantime Olson is working to improve the technology’s efficiency. In February last year, he founded Exonics Therapeutics, a biotechnology company based on his research, and in November secured $40 million from a science-driven capital firm, the Column Group. This funding may allow Exonics Therapeutics to be a leader in improving the efficiency of CRISPR and develop a cure or treatment that will overcome safety concerns. The level of public interest in Olson’s work shows the extraordinary impact this technology could have in the very near future. Dupree and many other patients worldwide remain hopeful that CRISPR could help prevent or cure the 20,000 cases of Duchenne muscular dystrophy that arise every year.